You may already have some friends in your Galaxy Tab. That’s because your Google account was synchronized with the Tab when you first set things up. Because all your Gmail and other types of contacts on the Internet were duplicated on the Tab, you already have a host of friends available. The place where you can access those folks is the Contacts app. If you haven’t yet set up a Google account, you can set one up. Most apps on the Galaxy Tab use contact information from the Contacts app. Those apps include Email, Gmail, and Latitude, as well as any app that lets you share information, such as photographs or videos. Information from your social networking apps is also coordinated with the Contacts app. 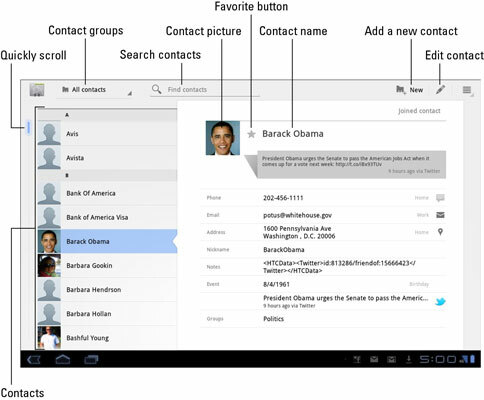 The Contacts app shows a list of all contacts in your Galaxy Tab, organized alphabetically by first name. Scroll the list by swiping with your finger. Or, you can drag the blue thumb button on the left side of the screen to quickly scan through the list. Place a phone call: Yes, the Tab is not a phone, but when you install Skype, touching a contact’s phone number activates that app, and you can use the Tab to make a call. View address: When the contact has a home or business address, you can choose that item to view the address using the Maps app. You can then get directions, look at the place using the Street View tool, or do any of a number of interesting things. View social networking status: Contacts who are also your social networking buddies show their current status. The status might also appear at the bottom of the info list, there may be a View Profile item to choose, or you may see a Social Network Feeds button, which lets you see all of the contact’s social networking status updates. Some tidbits of information that show up for a contact don’t have an associated action. For example, the Tab doesn’t sing Happy Birthday when you touch a contact’s birthday information. Not every contact has a picture, and the picture can come from a number of sources (Gmail or Facebook, for example). When a contact is referred to as a joined contact that means that the information you see comes from multiple sources, such as Gmail and Facebook.